The other day, I put together a very intense new ab workout for Kyla and her readers over at BodyRipped.net! This is a workout that my friends and I put together some years ago but is one we still find ourselves doing on a weekly basis. The level you choose will determine the number of repetitions you do on each exercise. After each full round, you will take a 30-60 second rest then complete 2-3 more times! This workout is incredibly tough and will build up great strength and endurance in your abs. Be sure to start with a rep number that will challenge you yet isn’t too hard. It is better to start with a lower number and build up so you can eliminate any major soreness. Drop me a comment below and let me know how you did! There is nothing I enjoy more than some great outdoor workouts! Especially now that it is summertime here in beautiful Minnesota, I try and get outdoors as much as possible for my workouts. Not only can you get in some amazing workouts outside, but you can also get your much needed daily dose of Vitamin D while your at it. The best part about the workout below is that it can be done anywhere without any equipment. Just your bodyweight and a small space, and you can make it happen. Workout Description: For each exercise you will perform 10 repetitions with no rest in between. In between full rounds, you will take a 20 second rest then complete 5 total rounds. Rest 20 seconds between full rounds and repeat 5 times! There you have it, an amazing outdoor fat burning workout! You will be performing 7 full speed sprints at 40-60 yards each. In between each sprint, you are required to do 10 crunches, 10 leg raises, and 30 seconds of planks! 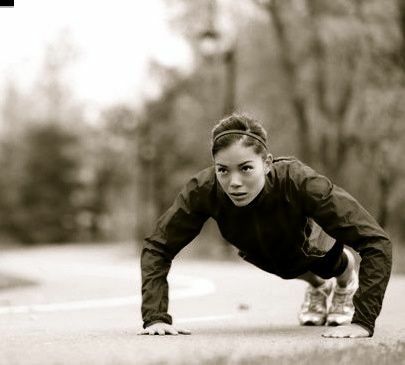 After the plank, take 20 seconds rest and complete the next sprint. Now it is time for you to give this workout a try. Let me know your feedback and check back soon as I will be posting more great outdoor workouts! In a study done by the American Council of Exercise, it stated that kettlebell swings burned up to 20.2 calories per minute. For such a simple movement that is incredible. In comparison, the same study also stated that a spin class only burns 9.8 calories per minute, less than half of the kettlebell swing. Read that again, a simple kettlebell swing can burn up to 20.2 calories per minute while a spin class only burns 9.8. After reading that, it is no wonder why kettlebell swings have been all the rage over the last several years. Kettlebell swings not only burn tons of calories and fat, but they activate nearly every single muscle in your body which by now you know is what you want when putting together your fat burning workouts. With the many different kettlebell exercises to choose from, this one piece of equipment can produce hundreds of workouts that will allow you to burn fat, build lean muscle, and supercharge your metabolism. The perfect strength and cardio workout all mixed into one. Boosts metabolism for hours after your workout is finished which means more calorie and fat burning. Doesn’t take a lot of time to do. 5-10 minutes is far enough time to get a great kettlebell workout in. Easy to do and can be done by all fitness levels. Easy on the body and joints. You do not need a gym. A simple 5×5 foot space will do the trick! Helps develop incredible core and functional strength. Provides you with hundreds of exercise and workout options. 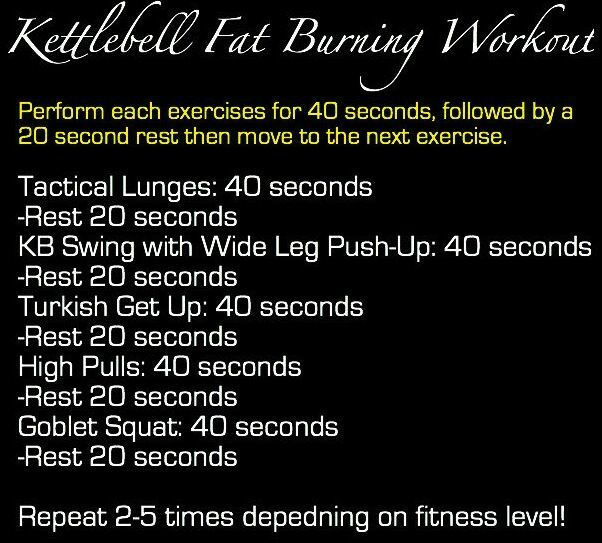 This list can go on and on, but I hope you are getting the idea that kettlebell is king when it comes to fat burning! Aside from sprints, the kettlebell swing is the next best workout and piece of equipment you can do to help eliminate unwanted fat and get fit fast. What Kettlebell Workouts Should You Do For Ultimate Fat Burning? As was stated, there are plenty of options for you to choose from. Also realize too that you can add in bodyweight exercises to go along with your kettlebell exercises. The workout options are endless. Perform 100 kettlebell swings resting only when needed keeping perfect form throughout. Choose a weight that you can only perform 20 swings at a time with. Perform each exercise for 40 seconds, rest 20 seconds and move to the next exercises. Complete 2-5 rounds depending on your fitness level. There you have it, three kettlebell fat burning workouts to help get you started. If you want to start seeing better results, start incorporating 2-3 kettlebell workouts a week!